Something you probably missed (I know I did) from recent City Council action. Last week Houston City Council voted to hire a company that will help local officials create and adopt a long-range waste and recycling plan. This wasn’t all over the news, but it is indeed a big deal—and a significant victory for Texas Campaign for the Environment that was years in the making. It could put Houston on a path to become the largest city in Texas working toward a Zero Waste future! Most of the rest of the article recounts the fight over One Bin For All, followed by the fight over Mayor Turner’s original proposed recycling deal, which was eventually sent out for a rebid. True to what author Roseanne Barone writes, I couldn’t find any news about this, but you can see the Council agenda item in question here. I don’t know how long this will take to turn into a report for review, but given the way these things go it will either be breathtakingly ambitious but likely infeasible, or overly cautious and thus criticized by disappointed supporters. We’ll keep an eye out for it. Houstonians stockpiling cardboard and aluminum cans, rejoice: the city will resume curbside recycling service next month. Recycling service has been suspended since Aug. 30, when city waste crews dropped all efforts other than weekly trash pickup to focus on removing the thousands of piles of debris resulting from Hurricane Harvey. Residents wondering whether their service will start the week of Nov. 13 – the “B” schedule – or Nov. 20 – the “A” schedule – can visit the Solid Waste Management Department’s website and click the “City Services Info Viewer” link. Homeowners are reminded not to place any of Harvey debris in their 96-gallon green recycling bins, and also to keep glass out of the containers. Pending the selection of a new recycling processer – an effort that was scrapped earlier this summer after council members questioned the procurement process – residents are stuck taking glass to any of the city’s six neighborhood drop-off sites or the Westpark recycling center. See here for the background. Everything you need to know is here, so click over and remind yourself of the dos and don’ts, as well as the schedule. I’m just delighted to have a little piece of normality restored. Click2Houston has more. Because most of the Harvey debris has been picked up. Win all around. Houstonians who have been dragging their overflowing recycling bins to the curb every other week only to roll them back again untouched finally should have their cartons and cans hauled off early next month, Mayor Sylvester Turner said Wednesday. City crews and scores of private contractors have trucked more than 1 million cubic yards of Hurricane Harvey debris to area landfills, the mayor said, and are nearing completion on the first of three planned passes to pick up storm waste from thousands of flood victims’ lawns. That soon should free up city recycling trucks to resume normal collection schedules after suspending the curbside service in the wake of Hurricane Harvey and the widespread flooding it caused, Turner said. Here’s the press release announcing this, which has details about the “second pass” of Harvey debris removal. Getting to this point represents a small amount of normalcy being restored. It’s not a big deal, but every little bit helps. There’s some stuff to like in this, and there are also questions to be answered. The city would send all 65,000 tons of bottles, cans and boxes its citizens recycle each year to a new processing facility to be built in northeast Houston under a 20-year deal Mayor Sylvester Turner will present to City Council next month. The contract with Spanish firm FCC Environmental, worth up to $57 million, would allow citizens to again put glass in their 96-gallon green bins, along with cardboard, newspaper, steel cans, aluminum and plastic. Turner, faced with a poor commodities market and rising recycling costs upon entering office last year, negotiated away hard-to-process glass in hammering out a two-year stopgap deal with the city’s current contractor, Waste Management. Council members raised enough concerns about the new contract’s length and cost and the speed at which it was being considered that Turner canceled a Tuesday committee hearing on the topic minutes before it was to begin and pulled it from Wednesday’s council agenda. Turner stood firmly behind the deal at a Wednesday news conference, however, saying the proposal would not only return glass to the city’s recycling program but also would require FCC to share in the risk of a crash in the commodities market, ensuring the city never pays more to recycle than it would pay to throw the same materials in a landfill. Under the proposed deal, if the revenue generated by selling recycled materials is less than $87.05 per ton, the city would pay FCC the difference, up to a maximum of $25 per ton. If the materials sell for more than $87.05, the city would get a quarter of that excess revenue. Under the current Waste Management contract, the city’s per-ton processing fee is $92, and there is no cap on the city’s costs. Houston’s per-ton costs have ranged between $20 and $53 per ton under that deal. Prior to the commodities market crash, the city paid a $65-per-ton processing fee. The FCC contract also would have the city borrow $2.4 million to add eight new trucks to its aging fleet and repay the loan at a 10 percent interest rate. That is significantly higher than what the city would pay if it borrowed the money itself. Councilman Mike Laster, who was to chair the canceled committee hearing on the topic Tuesday, echoed his colleague [CM Jerry Davis]. Texas Campaign for Environment’s Rosanne Barone said the contract’s processing fee and the interest rate on the $2.4 million loan are concerning. A broader worry, she said, is whether the contract leaves the city enough flexibility to capitalize on any improvements in its recycling policies in the future. Her group long has pushed the city to adopt a plan that would help it divert more waste from landfills. That processing fee, which was mentioned several paragraphs after the first section I quoted above and not in any of those paragraphs that discuss current and past processing fees, is $87 per ton. Which is a lot more than the previous deal we had with Waste Management, when they took glass and commodities prices were good, but a bit less than what we’re paying now. Like CM Laster, I’d like to know more before I make any evaluations of this. Having glass included in curbside pickup again is good, and having a price guarantee is good. I don’t quite understand the loan arrangement for buying more trucks, and the length of the contract could be a concern as well. Let’s learn more and see what if any options exist to make changes. The Press has more. Following reports of the first local mosquito-borne Zika infections in the U.S., Mayor Sylvester Turner is once again calling on the state of Texas and federal government to provide financial assistance to help fight it. Since February, the City of Houston Solid Waste Department has been conducting weekend sweeps of illegal dump sites that can serve as mosquito breeding grounds. To date, 3,433 tons of debris and 29,130 tires have been hauled away at an annual cost of $3.6 million. With some additional state or federal funding, the City could purchase new equipment to increase collection frequency beyond the weekends, develop and distribute educational materials informing residents of proper and free disposal options and establish three additional heavy trash drop-off locations. Last week, the Houston Health Department was awarded $1.5 million by the Centers for Disease Control to use for surveillance, testing and prevention. The City is already in discussion with Harris County on the best way to maximize the use of these dollars. Houston has documented 12 travel-associated cases of Zika virus infection since the start of the outbreak in Latin America earlier this year. Harris County has confirmed another 12 cases – 11 are travel related and one is an infant with microcephaly born to a mother who contracted the virus while traveling outside the United State. There are a total of 80 confirmed Zika cases in Texas. At this time, there is no evidence the virus has infected mosquito populations in the state. In addition to the neighborhood trash sweeps, the City has public service announcements at the airports, on public transit, in city water bills and on local TV. The health department is going door-to-door to distribute insect repellent in underserved neighborhoods, and the City’s regional public health laboratory is supporting local hospitals and clinics with Zika infection testing. Residents are encouraged to follow the three Ds of mosquito defense: drain, dress, DEET! Drain standing water on your property and keep hedges trimmed. Wear long pants and long sleeves, keep windows and screens repaired and use air conditioning. When outside, spray exposed skin with mosquito repellant containing DEET, reapply as necessary and use netting to protect babies in strollers or car seats. This is not the first time Mayor Turner has asked for this help. I doubt the Republican-controlled Congress is any more interested in taking action now than it was then, but it can’t hurt to ask. Better to keep expectations low, though. Through a new partnership with Strategic Materials Inc., North America’s largest glass recycler, the City of Houston is able to offer residents a more convenient way to recycle glass. The City of Houston Solid Waste Management Department will send out notices as the other eight locations are added to this pilot program. The locations and progress of the program will also be available on the Strategic Materials company website. 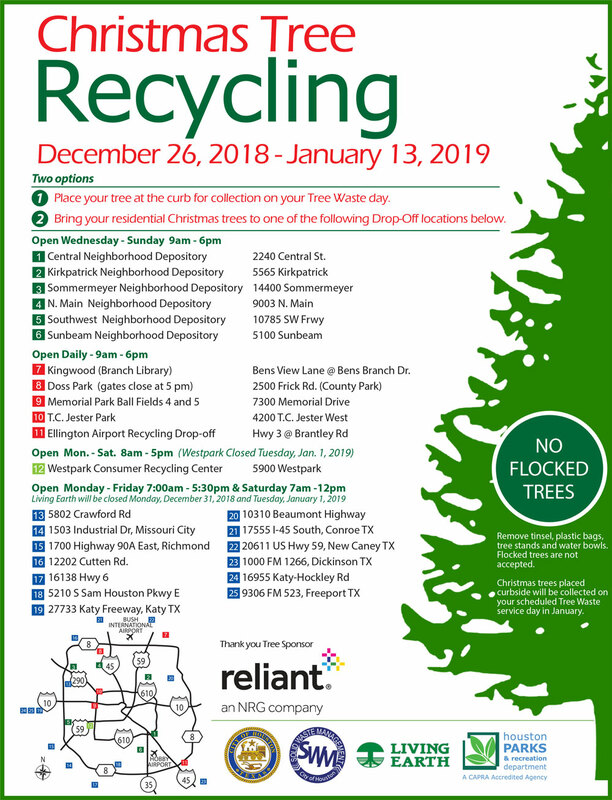 These new drop off locations sponsored by SMI and partners are in addition to the nine existing City of Houston neighborhood depositories where residents are able to recycle glass and other items. Due to cost concerns, glass was removed from the City’s curbside recycling program last March. Information about this pilot project, curbside recycling and other topics is available at www.houstonsolidwaste.org. Please remember to empty and rinse all glass containers, and remove all corks, caps and lids before dropping them off. Very good news for everyone who still wants to recycle glass and doesn’t have other options for curbside pickup. I presume these dropoff locations will have separate bins for clear and colored glass, since it’s less expensive to process glass that is pre-separated. Basically, this gets us back to a position we were in before curbside glass recycling was available, but with the bigger green bins and more things (like cardboard) that can be put in them. We’d still like to get back to where we had been, with glass being allowed at curbside, but until then this at least makes it a little less inconvenient. After weighing the budgetary impact and obtaining input from City Council, Mayor Sylvester Turner has decided not to pursue elimination of subsidies to homeowners associations that opt out of City trash collection services. Under the program, which began in the 1970s, the City pays a monthly $6 per household subsidy to homeowners associations that contract for more expensive trash collection service from private haulers. Elimination of the subsidy was predicted to save the City $3.5 million annually, but only if the homeowners groups stuck with their private haulers. Elimination of the trash subsidy was one of several options put forth to help close a projected $160 million budget shortfall in Fiscal Year 2017, which begins July 1. City Council will consider the budget on May 25, a full month earlier than normal. Mayor Turner has requested early approval to send a strong message to the credit rating agencies about the attention the City’s fiscal challenges are getting from City Hall. See here for the background. I was rooting for this to be killed, but if the numbers say it will cost more than it will save, then so be it. That doesn’t mean we can’t plan to phase it out over the next few years, however. I’d like to see that on the table going forward. The Chron story has more. 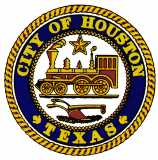 Beginning Saturday, April 23, 2016 the City of Houston Solid Waste Management Department and private contractors working on the City’s behalf will begin storm debris collection in the single-family neighborhoods impacted by Monday’s flooding. This includes the following areas. The City asks residents to help by separating everything into the following six categories. Normal Household Trash – Normal household trash and bagged debris of any kind will not be picked up with debris as part of this program. You should continue to follow your normal garbage schedule. Residents should not place debris piles near other objects like fire hydrants and mailboxes or under power lines or low hanging branches that would interfere with the collection equipment. The City is also continuing to help with debris removal from inside 17 privately-owned apartment complexes in the Greenspoint area. It took until the wee hours of the morning, but all remaining flood evacuees who had been sheltering at M.O. Campbell Center have now been relocated into hotel rooms and the shelter has been closed. Well over 150 families are being provided hotel rooms for up to three weeks at a cost of about $150,000. The City is using the Greater Houston Storm Relief Fund to cover the costs. Catholic Charities and the American Red Cross are working to coordinate meals for the hotel guests. Yellow Cab and METRO assisted with the massive transportation effort from the shelter to the hotels. Everyone was placed in hotels in the immediate Greenspoint area so their children are in close proximity to their schools. The hotel accommodations are meant to be temporary housing until apartment repairs are finished or alternative units have been identified. Approximately 1800 apartment units suffered minimal to major flood damage in the Greenspoint area. The apartment owners have 400 workers on site making repairs. In addition, the City has stepped in to help with debris removal so it does not pile up and become a breeding ground for mosquitoes. Debris collection begins today in the single-family areas impacted by the floods. 20 contract crews are working seven days a week with the City’s solid waste staff in nine neighborhoods. They are unable to get to the Kingwood/Forest Cove areas because flood waters remain high. The Mayor’s office is also partnering with Airbnb, which has asked its hosts in Houston to share for free any extra space they have. The temporary accommodations are available to displaced residents and volunteers here helping with the relief effort. The offer is good from now until May 14. Listings of the available housing can be found at https://www.airbnb.com/disaster-response. Glad to hear it. The Chron story on this is here, and as always, don’t read the comments if you want to maintain any faith in humanity. The Rockets made a $500,000 donation to The Greater Houston Storm Relief Fund before Thursday’s game. Hopefully many others will follow that lead. That new recycling agreement with Waste Management was on Council’s agenda yesterday. Here’s a reminder of what it was about. Originally, Houston was to ink a four-year deal with Waste Management, paying a $95-per-ton processing fee, a nearly 50 percent price hike. [Mayor] Turner, hoping the market would rebound quickly and strengthen the city’s negotiating position, countered with a one-year deal at a higher processing fee, but Waste Management rejected that. The deal facing a vote Wednesday is a two-year agreement that omits glass, which is more costly to process and comparatively less valuable to resell, and carries a $90-per-ton processing fee. Compared to what other Texas cities pay, that figure – and even the $65-per-ton processing fee Houston paid under its expiring contract – is an outlier. San Antonio, Dallas and Fort Worth all pay their recycling contractors about $35 per ton to process recycled material; in the latter two cities, Waste Management is the vendor. The other Texas cities’ contracts are much longer than any of the deals Houston was considering, however, and took effect when the market was stronger. Dallas’ deal, inked in 2007, expires at the end of the year. Fort Worth’s current agreement began in 2013 and expires in 2018. San Antonio began its contract in August 2014, as commodities entered their current slide; that deal runs through 2024. Only Austin pays rates similar to Houston’s, under 20-year deals with two contractors that began in 2012. Balcones Resources, which gets 60 percent of Austin’s recyclables, collects $79 per ton to process the first 2,000 tons of material every month and $75 for every ton after that. 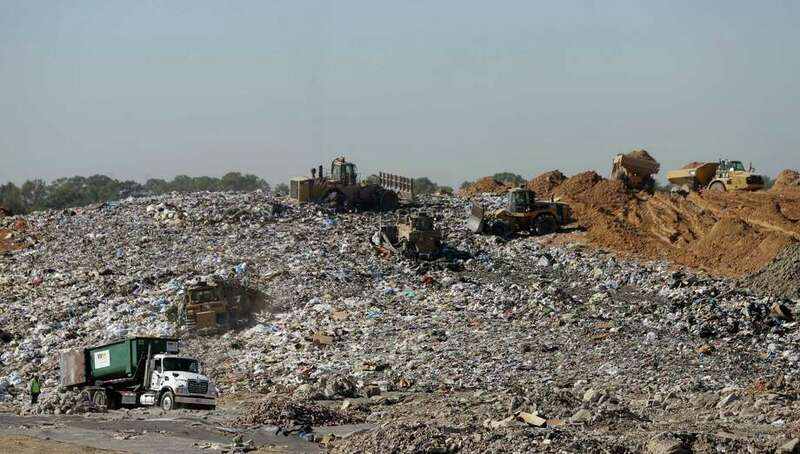 Texas Disposal Systems, which gets the remaining material, charges $90.50 per ton. Scruggs said a key difference between Houston and its peer cities is that Austin, Dallas and San Antonio have adopted waste diversion goals backed by investments in public education, recycling programs at apartment buildings or composting efforts. Those efforts have strengthened the cities’ recycling markets. In the end, the new contract was approved, with two No votes. The city and groups like TCE will get the word out to people about not putting glass in their bins. In a best-case scenario, people will bring glass to recycling centers and the city will make a few bucks from that to help offset these other costs. Most likely, the vast majority of that glass will wind up in trash bins, which will cost the city some money but not as much as it would for the glass to be in the recycling bins. A Zero Waste goal and plan would probably help with that – you can see the TCE make its case for that here – so I hope the city begins consideration of a “draft recycling plan” before this contract expires. Sure hope there’s a plan. Houston’s curbside recycling program is in limbo after Mayor Sylvester Turner and City Council rejected a new contract with Waste Management on Wednesday, prompting concern among residents and environmental activists about a potential lapse in service. Such a lapse would come about a year after the city finally expanded its curbside program to all homeowners. It also would occur amid an ongoing City Hall push to close a budget gap of more than $126 million by July 1, an effort likely to result in layoffs of city workers. Turner emphasized that he is committed to recycling but said he was uncomfortable entering into an agreement he viewed as working against the cash-strapped city’s best interests. The city’s current contract with Houston-based Waste Management to process recyclables expires March 16. Turner plans to announce a new recycling plan Monday. He declined to offer details on the options available to the city but said he is looking to other bidders. In an emailed statement, Waste Management said the firm remains open to working with the city and is prepared to accept recyclable materials without a contract. Waste Management’s current noncontract recycling rate is $104 per ton, the same amount Turner proposed paying under a one-year deal. See here for the background. I don’t know what Mayor Turner has in mind, but I can’t wait to hear it. If I were the one who had to come up with something, I might suggest a two-year deal – Waste Management proposed four years, the city said one year – with the hope that commodity prices (largely a factor of China and its economy) might have crept back up by then. The city doesn’t want to get locked into a long-term deal where they have to pay a high price, while Waste Management wants some price certainty. Maybe that would work, and maybe there are some other players out there eager to jump in on this market. I sure hope so. In the meantime, we may wind up paying the rack rate for awhile. Tune in Monday to see what the Mayor has up his sleeve. The city of Houston’s curbside recycling program could be put on hold after negotiations between Waste Management and Mayor Sylvester Turner’s office reached an apparent impasse over a new contract Tuesday. Though Turner said he remains committed to recycling and his office said he will be “pursuing any and all available options” before the current contract expires March 16, the standoff could see Houstonians’ recyclables trucked to a landfill as early as next week. The mayor acknowledged the breakdown Tuesday after Waste Management rejected Turner’s attempt to shorten a proposed four-year contract extension to one year. Waste Management for years has been processing and reselling Houstonians’ recyclables, taking a $65-per-ton fee from those revenues and giving 70 percent of any money left over to the city. If the firm’s costs exceeded the fee the city paid, Waste Management swallowed the difference. With plunging oil prices dragging commodities below $50 per ton, however, the firm has been renegotiating contracts. The deal before council, which was being negotiated before Turner took office, would see the city pay a processing fee of $95 per ton for at least four years. Turner’s office said he now agrees with council that such a term could trap the city in an unfavorable rate even after the market recovers. Turner instead had sought to shorten the deal to one year in exchange for a higher, $104-per-ton fee. Waste Management rejected that deal Tuesday, shortly before the mayor faced residents pleading with the council not to end the city’s recycling program only one year after it was expanded to give all homeowners the popular 96-gallon green bins. See here for the background. The Press has an explanation for why we are in this predicament. Melanie Scruggs, program director for the Texas Campaign for the Environment, says a major pratfall with Houston recycling is Waste Management’s monopoly over the city. I don’t know what the solution to this is if Waste Management won’t go for a shorter-term deal, which I think the city is correct to pursue. Not recycling isn’t an option, unless you really want to see Houston get another large round of negative national publicity. The timing of this just couldn’t be worse, and we’re a week away from the current contract expiring. It’s a mess. For those of you who want to do something that might help, the Texas Campaign for the Environment has a customizable email message you can send to the city. Calling your Council members (district and At Large) is never a bad idea, either. It had a good run, but at the very least the timing was all wrong. 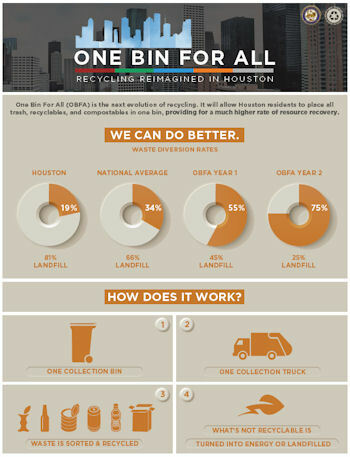 The One Bin For All program would let Houstonians throw all trash in the same bin, to be separated for recycling later. The hope was to push up Houston’s low recycling rate. But now the city could end up with no recycling at all. The city council on Wednesday delayed a vote on a new contract with Waste Management, which would cost the city about $3 million more per year because commodity prices for recyclables are low. Several council members are calling for suspending recycling until that changes. The One Bin program was not mentioned at all in the discussion. It turns out Mayor Sylvester Turner is not a fan. See here for the last update. Mayor Turner had spoken in generalities about One Bin before now – I’d have to go back and re-listen to the interview I did with him for the 2015 election, but that’s how I remember him speaking about it then as well – so this is a rhetorical shift for him. It’s not exactly a policy shift in the sense that he had never committed to doing anything with One Bin, so think of it more as a door being closed. As for the Council action, the Chron story from Wednesday before the meeting suggested some pushback on continuing the recycling contract with Waste Management, but nothing more than that. Until now, Waste Management would resell the recyclables, deduct a $65-per-ton processing fee and give 70 percent of the remaining revenue to the city. If the firm’s costs exceeded the fee the city paid, Waste Management ate the difference. Those terms meant the city could make $25 per ton two years ago, when recyclables were bringing $100 per ton. Now, with commodities prices at lows not seen since the 2009 recession, Waste Management has been dropping or renegotiating its contracts with Houston and many other cities. If City Council approves the new deal, the city next month will begin paying a $95-per-ton processing fee. With commodities now earning $48 a ton, that means each ton of material recycled will cost Houston almost $50, at least in the near term. That’s nearly double what it would cost to truck the recycled items to the landfill, where the tipping fee is $27 per ton. And, with Mayor Sylvester Turner warning that layoffs will be needed to close a projected $126 million budget gap by July, some council members are inclined to quit recycling until the market improves. Councilman Jerry Davis, whose District B is home to landfill facilities, disagreed, citing studies showing negative health outcomes for those near dump sites. See here for the background. The single-stream recycling program has been pretty popular, so I kind of doubt it’s in any danger, but I’m not surprised that there was some grumbling about possibly having to pay for something we used to make money off of. And if the words “garbage fee” are forming on your lips, you may want to bite your tongue. If you were concerned Mayor Sylvester Turner could consider pushing a new garbage fee to cover that cost, however, think again. I don’t agree with that – at the very least, I think we ought to keep the option open – but that doesn’t appear to be the case. We’ll see what Council does with this next week. Really interesting story about a place most of us would not think to visit. The open face of the Atascocita landfill in Humble slopes downward, where trucks unload the cast-off scraps of daily life. Bulldozers spread the debris to a depth of a few feet before trucks with spiked tires take turns compacting the heap, lumbering over the uneven surface. Some 500 trucks dump garbage here each day and the mound keeps growing – but not as fast as it did just a decade ago, thanks to consumers’ recycling and composting habits and an effort by manufacturers to use lighter-weight materials for packaging. Population growth is what keeps the garbage pile growing now. Nationally, per-capita disposal rates have dropped close to the levels of the 1990s. Houston-based Waste Management, the nation’s largest municipal waste company, said it lost $188 million in revenue last year, and $133 million the year before from lower volumes of all the materials it collects in trash and recycling. The company runs 247 solid waste landfills in the U.S. and Canada. Its landfill management business, however, has fared better than collection and recycling, the company reported. 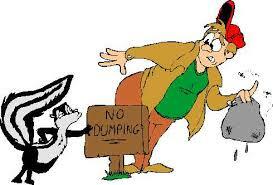 Its landfills also accept waste from other collection companies that pay to drop the trash there. About 70 percent of the waste that comes in to Atascocita arrives on Waste Management trucks. There, 25 employees process 4,500 tons of trash per day six days a week. Starting at 5 a.m. they’re screening for hazardous waste and taking trucks’ weight on scales. Others check the more than 30 pipes that gather gasses from completed landfill, herd trash trucks in and move screens around the open landfill to catch stray paper on windy days. Nationally, in 2013 we sent 11 million fewer tons of trash to landfills than we did in 1990 the U.S. Environmental Protection Agency said. Last year Texans each produced 6.58 pounds of waste per day. Though that’s higher than the last several years, the number didn’t drop below 7 pounds per person from 2000 until 2009, when the recession led to less consumption and less trash. But according to the EPA, the amount of waste each American tosses reached its lowest point in 2013 since 1990. The agency estimates that about 2.89 pounds of trash per person each day actually ends up in a landfill. Texas’ numbers are calculated differently to include some construction waste and don’t account for diversion to recycling and compost. Recycling is cutting out a lot of the waste we now send to a sealed, compacted mound of trash. The EPA reported that in 2013 more than a third of waste was recycled. Of the total 254 million tons of waste generated by American households and businesses last year, 87 million tons were diverted from landfills. We’re also using less paper, in the office and for the newspapers we read, reducing a lot of waste. “Part of it is more aggressive recycling and part of it is from the packaging perspective there’s been a lot of light-weighting,” said Chuck Rivette, regional director of planning and project development for Waste Management. Most packaging uses less material than it did several decades ago. Plastic water bottles use as much as 50 percent less plastic and thin plastic pouches have replaced bulkier plastic bottles and boxes. “Even if you bought the same number of bottles an didn’t change your habits, your (trash) generation’s gone down,” said Anne Germain, director of waste and recycling technology for the National Waste & Recycling Association. Like I said, a good read, and you’ll likely learn something from it as I did. The city’s goal needs to be to continue the downward trend of each person’s waste per day. More recycling – I was glad to hear multiple Mayoral candidates talk about bringing recycling to apartment complexes – and more composting would be good starts. If that means instituting a trash fee – to fund such activity and to help ease the current budget shortfall – then so be it. However we do it, that’s the destination we need to aim for – more recycling, more composting, less trash sent to landfills. As a committee mulls an ambitious and controversial “one bin” project that could overhaul recycling and waste collection in Houston, the city’s traditional mode of getting rid of trash just got cheaper. A renegotiated contract with the city’s primary waste hauler, approved by City Council late last month with little fanfare amid a deluge of end-of-year requests, is set to save the city about $600,000 annually, according to the city’s Solid Waste Management Department. The $226 million contract to handle much of the city’s waste belongs to BFI Waste Services of Texas, whose parent company is industry giant Republic Services. The coveted contract underwent a massive rewrite in 2009 that did away with a painful “put or pay” clause that meant the city had to deliver a guaranteed amount of waste or cough up the monetary difference. Through the life of the contract, those changes will save the city an estimated $70 million. The most recent savings, smaller but still significant as the city whittles away at a looming budget deficit, come courtesy of lowered tipping fees – the amount, per ton of trash, the city pays at the gate to a company to process its waste at transfer stations and landfills. Those fees can add up, and in some large urban cities run more than $50 per ton. In Houston, the city has now scaled the fees back by about $1.50 per ton, amounting to about $23.50 per ton. Set annual price increases will continue as scheduled, but the city has essentially reset the clock on its landfill fees to a few years ago. “We’ve been very mindful and particular with how we spend the public dollar,”Solid Waste Management DirectorHarry Hayes told City Council members last year during a budget meeting. The city is Republic’s biggest local customer, deputy solid waste director of operations Victor Ayres said , which offers some leverage in negotiating lower rates. The city has sent less trash to the landfill during the past five years. In fiscal year 2014, the city sent 628,978 tons to the landfill, 10,000 tons fewer than the year before and about 21,000 tons fewer than in 2012. Can you imagine having to pay more for not providing enough garbage to the landfill? It’s so wrong on so many levels I can’t even wrap my mind around it. The city is going in the right direction here, and saving a few bucks in the process, but there’s a lot more to be done. Recycling rates, or diversion rates if you prefer, are still well below the national average. A big part of it is that too many people just don’t have a recycling mindset. I get ill at the sight of so many aluminum cans, glass bottles, and plastic containers pitched into trash cans wherever I look. That’s part of the allure of the One Bin proposal, for which the RFPs are still being evaluated by the city. But whether we go that way or not – and please, I’m not looking to get bogged down in that debate right now – just having people think twice before they toss their beverage container or whatever into a waste bin would be nice. Throwing it away like that is wasteful in more ways than one. All Houston homes will be covered. All Houston residents who get city trash service will be able to roll their recyclables to the curb in 96-gallon green carts by the start of 2015, a milestone that has been years in the making as the city slowly expanded the program, frustrating neighborhoods that sought to be included. City Council on Wednesday will be asked to approve the purchase of 95,000 recycling bins to cover the 90,000 homes, or about one-quarter of Houston residences, that are without any form of curbside recycling. Another batch of bins now held in reserve will replace the 18-gallon recycling tubs still used by 5 percent of homes. These smaller bins do not take glass, while the larger cartons take all recyclables. City officials said they expect the ease of using the wheeled carts will boost Houston’s dismal 6 percent recycling rate, which lags behind the national rate of about 34 percent. “The beauty of this thing is that everybody will be able to participate in the recycle process,” said Councilman Dwight Boykins, who has been vocal in pushing for the recycling expansion in recent months. The expanded service will likely go into effect in January, around the same time the city is expected to announce a possible contract for its ambitious “One Bin for All” proposal. That program would offer a wholesale change to Houston’s recycling system, allowing residents to mix waste and recyclables – and perhaps even food and yard waste – together in the same bin to be sorted automatically at a first-of-its-kind facility, built and operated by a private firm. 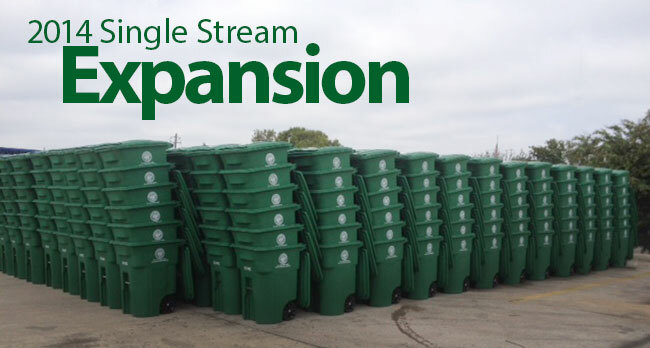 last expansion of the single stream program was in May. Some neighborhoods have been waiting since 2007 for the big green bins, so this is a momentous occasion. What happens after that depends on what happens with the One Bin program. As the story notes, the big green bins would be the One Bins, with the black bins now used for garbage being collected by the city, presumably to be recycled. I didn’t see a press release from the city for this or any announcement on the Solid Waste webpage, so I presume this means that if you have your garbage collected by the city and you don’t already have one of the big green bins, you should expect to receive one by January. You can find a link to service maps at Houston Politics or just take my word for that. Not surprisingly, One Bin opponents Zero Waste Houston put out a press release praising the expansion of single stream recycling and calling for One Bin to be abandoned. See beneath the fold for their press release. Who out there is still waiting for their big green bin? As of August 1, to be exact. “We are starting with a new recycling processor that can accept the bags so that allows us to add it to the list of items we can accept,” [Solid Waste Management Department Public Relations Manager Tiffany] Edwards said, adding that the move gives San Antonians another option to recycle the bags, in addition to major grocers and retailers that will typically take the bags back and recycle them. The new recycler is Recommunity Recycling, which has its corporate headquarters in Charlotte, N.C.
Edwards said residents should take one plastic bag and stuff all the other ones in it until it is about the size of a soccer ball before tossing it in the bin. But not all plastic bags are accepted. And don’t forget to take your receipts out of you grocery bags either, she said. Black bags aren’t accepted because the bags are a different grade of plastic than the translucent ones and because workers can’t see into the bags, they pose a hazard, Edwards said. So why start accepting plastic bags now? “Across the nation, a lot of processors can’t take them because they get stuck in the machinery,” Edwards said. But the city’s new processor can. Pretty cool. San Antonio has been on a journey that began in November last year. We first heard about their plan to do curbside recycling of plastic bags in March, but they still ultimately intend to implement a ban of some kind later. They have yet to determine what direction that ban will take, but it’s in the works. 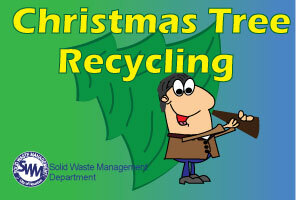 You can learn more at SA Recycles and the city’s Solid Waste Management page. Note that they take all forms of plastic plus styrofoam containers in their bins; you can’t put #6 plastic in the city of Houston’s bins, though you can drop of some styrofoam at the various service centers. We need to catch up here, Houston. Mayor Annise Parker and Harry J. Hayes, Director of the Solid Waste Management Department (SWMD), are pleased to announce the addition of 62,000 to the City’s popular automated curbside recycling program. As part of the expansion, residents in neighborhoods throughout Houston will receive a new 96-gallon green automated cart similar to the black automated garbage cart they already have. The green carts will take paper, plastics, metals and glass out of the waste stream. Cart delivery will begin this week, with the first collection occurring the week of June 23rd. Recyclable items that can be placed in the containers include: newspapers, magazines, office paper, junk mail, cardboard, paperboard, paper bags, glass bottles and jars, aluminum cans, tin and steel cans and plastics 1 – 5 and 7. 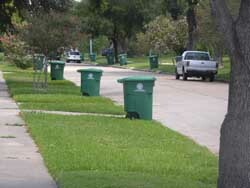 For areas included in the expansion, visit the Solid Waste Management Department web site at www.houstonsolidwaste.org and go to the section titled “Automated Curbside Recycling Program Expanded to 62,000 Homes” and follow the links. Here’s the link to that map. For my neck of the woods, this includes a sizable chunk of the Heights – the area bounded by 11th Street, Yale, North Shepherd, and Loop 601 – that had been previously left out, as well as Timbergrove and the area east of I-45 south of Moody Park. I know a lot of people who are going to look at this map and start doing the happy dance. If you’re inside the Loop, other than a few areas in the Third Ward, you will have single stream as of June 23 if you don’t already. Since we all agree that more single stream recycling means more households participating in curbside recycling, this is great news all around. Hopefully by next year, the remaining few places that still don’t have the big green bins will get them. Houstonians accustomed to throwing out glossy cardboard cartons of milk, juice, soup and others foods and beverages now can send them to the curb in a green container for recycling. The Carton Council, a consortium of carton manufacturers, has helped the city’s existing paper recycling processors purchase equipment that will keep much of these materials out of landfills. The predominantly paper cartons can be repurposed into paper towels, tissues and even building materials, said Gary Readore, chief of staff in the city’s Solid Waste Management Department. See the City of Houston Solid Waste Facebook page for more. I’m excited by this, because cartons – milk and orange juice, mainly – are a big component of our trash volume these days. Beyond that, it’s things like #6 plastics, plastic bags and wrappings, and food waste. Some forms of #6 plastic – polystyrene – can be taken to city recycling centers, things like plastic bags can be taken to grocery stores, and we compost non-animal product food waste, but more curbside options would be nice, and would help increase participation rates. I don’t want to get into the One Bin debate here, I’m just saying that I look forward to the day when I hardly have any trash to put out. This is a step towards that and that’s a very good thing. A public service announcement from the city. The holidays are upon us and that means cooking turkeys, hams and other foods that either require cooking oils to prepare or that generate a surplus of grease when cooked. Used cooking oils and greases, when disposed down the kitchen drain, cool, harden and clog the pipes. Diluting it in hot soapy water is NOT a solution. You can avoid possible clogged drains for the holidays by putting excess grease in a disposable container and put it in the trash or drop-off at a place that recycles and turns it into a usable product, such as biodiesel. Second Thursday of each month – 9 a.m. – 3 p.m.
Tuesdays and Wednesdays – 9 a.m. – 3 p.m.
Second Saturday of each month – 9 a.m. – 1 p.m.
Monday through Saturday – 8 a.m. – 5 p.m.
Monday through Friday – 10 a.m. – 6 p.m.
For information about Corral the Grease or ways to properly dispose of used cooking grease visit http://www.publicworks.houstontx.gov/utilities/corral_grease.html. Good to know. Even if you can’t recycle, please don’t try to wash your used cooking oil down the drain. Your pipes will thank you. From last week, some good news for those of who that still don’t have the 96-gallon wheeled recycling bins. Houston will roll out its biweekly, automated curbside recycling service to 70,000 additional residences throughout the city just in time for Thanksgiving, the Department of Solid Waste Management announced [last] Friday. The expansion will bring service to a total 210,000 households – more than half of the residences in the department’s service area, spokeswoman Sandra Jackson said. The automated curbside service will be extended to 60,000 more residences in the spring. The program began in 2009 with 10,000 households. Letters concerning the program will be mailed to new participating residences. Wheeled 96-gallon containers will be delivered beginning the week of Oct. 28. Collection will begin the week of Nov. 25. The press release from the city Solid Waste Department, along with a list of included neighborhoods, is here. Council approved this expansion earlier in the month. This expansion and another one for an additional 60,000 houses in the spring were built into the Mayor’s budget, thus bringing us closer to the goal of having all houses receive recycling service without imposing a garbage fee. That approach is certainly open to debate – I’d have been willing to pay a monthly fee, or to support a pay-as-you-throw fee designed to minimize landfill-bound waste – but it’s what we’ve got. Still in the works is the One Bin For All plan, for which RFQs were issued in June. The deadline for those submissions was August 22, and it occurs to me that I haven’t seen or heard anything on it since then. I’ll need to follow up on that. In any event, the march towards more curbside recycling continues. Check and see if your neighborhood is on the list if it wasn’t already receiving the service. City Council on Wednesday OK’d funding to complete efforts to double the number of 96-gallon green recycling bins parked at city curbs, but it is unclear which 70,000 homes will be next to receive the service. The delay in naming which neighborhoods will be part of the second expansion comes from ongoing discussions with council members and coordinating routes so neighborhood collection days do not change, [Solid Waste Management Department Director Harry] Hayes said. Once the new bins are wheeled out, the percentage of Houston homes with a 96-gallon bin will have increased from 28 to 55 percent, to about 210,000 houses. Add in those residents using 18-gallon tubs and an estimated 63 percent of the city will be able to recycle without driving to a drop-off center. “My goal is to have curbside recycling at every household in the city,” [Mayor Annise] Parker said. The first wave of recycling expansion was announced in May, when the budget was released. It brought the 96-gallon wheely bins to 35,000 houses, and broke the heart of some of my neighbors because they weren’t on the list yet. Maybe this announcement will make them happy. An audit of this year’s first expansion shows about three-quarters of the homes with the new bins actually roll them to the curb, which diverts waste from landfills and creates savings Hayes said he plans to use for expanding the service. I’d like to know more about who has the bins but isn’t using them, and why. I can’t think of a single good reason why anyone would not use them, and frankly the fact that some 25% of those who have them don’t use them is the best argument I can think of for some kind of “pay as you throw” garbage fee. Our unacceptably low rate of recycling is a major reason the city has been pursuing the One Bin For All solution, and while I get that I feel like we need to make a stronger push to get people to use what we’ve got already. Let’s start by finding out why some people don’t use it, and see what we can do to change that. City Council District B will be the site of a pilot program in which five surveillance video cameras have been placed in undisclosed locations, [Mayor Annise] Parker announced. The cameras will be monitored in real time by the Houston Police Department’s Environmental Investigations Unit, which will relay information about illegal dumping incidents to patrol officers for follow-up. Should the three-month pilot project prove effective, the city will buy another 20 cameras under a budget amendment by District B Councilman Jerry Davis. Parker hopes the program will identify 50 to 80 illegal dumping cases a month. HPD’s environmental investigations unit has investigated 1,159 cases so far this year, said officer Stephen Dicker. Here’s the city’s press release on the initiative. Note the use of surveillance cameras, which in this instance strikes me as an appropriate way to deploy them to help fight crime. If you’re wondering about HPD having to watch hours of video to catch these dumpers, technology will lend a hand to that effort. I hope that effort turns out to be very successful. It’s best to put your trash can where the automated pickup arm can get it. Last year, at least 9,000 trash cans in the city were left uncollected at some point, according to records kept by the city, a small percentage of the total number of bins emptied in a year, but enough to slow down an otherwise efficient operation. On a recent morning, for example, one trash can was left too close to a mailbox, another was blocked by a parked car. [Garbage truck driver Derrick] Colomb had no choice but to slap orange tags on the offending bins. Other times, what makes sense to residents becomes a huge inconveniences for the trash collector: a box full of paper sitting on top of a bin that fell off and spilled when Colomb tried to pick it up; smaller items of garbage thrown into the bin without being bagged, such as dirty paper towels, spill all over the front yard; bins that are filled over capacity. The ZIP codes with most uncollected trash calls are 77004, 77026 and 77087, according to city records. City officials say those neighborhoods are plagued with unauthorized trash cans and illegal dumping. “They in general put out more trash and trash cans,” said Jeffery Williams, deputy assistant director of Houston’s Solid Waste Management Department. I seem to recall my bin not being emptied once or twice, but I don’t recall receiving a tag on it, which would presumably have explained why. If I’m remembering accurately, I’d say the most likely reason was a parked car too close to the bin. If you’ve ever seen the way this works, you’d understand why this is an issue. Basically, there’s a swinging arm that protrudes from the truck, with a pincer end that grabs the bin, then the arm lifts the bin and swings it over the truck, turning it upside down to empty it. This is true for both trash and single stream recycling bins. I definitely do see loose bits of trash or recycling on the ground occasionally after pickup, probably on days that are a little windy. Anyway, if you’ve ever wondered about this, now you know. Watch where you put your bins, and don’t overfill them or stack anything on top of them. Your garbage collector will thank you for it.